Allison Claire Chang is a Bay Area–based writer and editor. She is managing editor and executive vice president of The Arthur Szyk Society and author of Heroes of Ancient Israel: The Playing Card Art of Arthur Szyk (Historicana, 2011). We all know about Norman Rockwell. 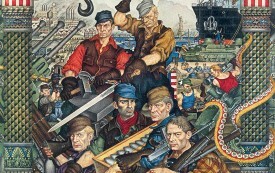 But it was Szyk who best conveyed the life-or-death urgency of the struggle against fascism.